LG is about to cash in on the booming netbook market, after announcing their own brand mini-laptop LG X110 which was unveiled this week and will cost around £320. 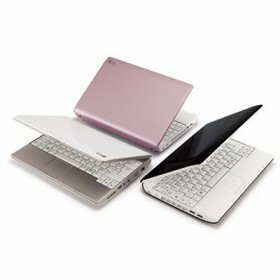 The mini-laptop will be initially availble at phones-4-u shops everywhere the UK & on their website from late October in two colours – pink & white! A black version is expected to also be available some time afterwards. how can i use the LG x110 smart cam for capturing images and video recording? I ask this because i cannot find the application anywhere!! !Pleae reply soon!!!!!!! Have you tried Skype or Microsoff Live Messenger ? Both has a thorough test suite that verifies if your webcam is working , along with Mice and Sound. A bit late answer perhaps. I’m myself about to refresh my own LG X110 to become a Linux Mint 15 desktop (using Mate on 32 bit). I didn’t dare to get Win8 running on it.